Occasionally an interspecies creature camaraderie comes along that looks almost too adorable to be real. Calley Gibson-Stoll is the proud person of two embraced pit bull combinations named Pikelet and Patty Cake, whose pleasant natures defy all the stereotypes about bullie combinations. The truth is, the dogs are good natured, that they are now helping Gibson Stoll to cultivate a pair of ducks that are youthful. The ducklings, named Popinjay and Penguin, were promptly adopted by the favorable pups, with Patty Cake taking on the part of duck-mom. Both couples love taking experiences collectively, and result in an adorable quartet. The ducks love nothing better than nesting atop the heads of Pikelet and Patty Cake. And you CAn’t deny this is an incredibly photogenic group. 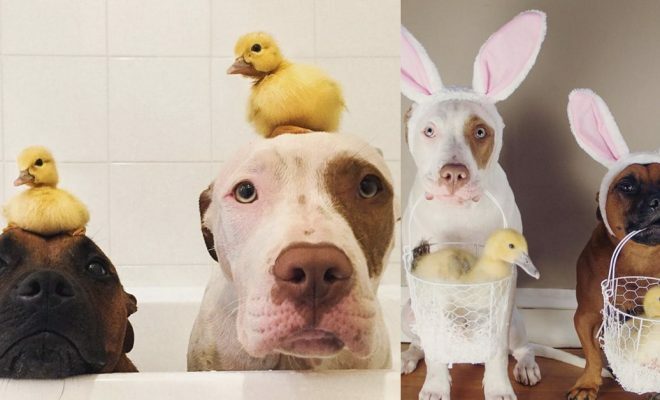 I can not even with dogs and these ducklings. The ducks are five weeks old, and they are still lively with their canine companies, though they are becoming larger. The ducks will be adopted by a brand new family shortly, but Gibson Stoll says the dogs will need to approve any future adopters — ! My heart is bursting from cuteness.